Chocolate covered marshmallow bunnies make the perfect Easter basket candy. 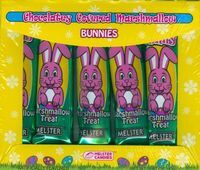 Each marshmallow bunny is covered with creamy milk chocolate. 5 Individually wrapped bunnies wrapped in festive foil approx 5". We have all your favorite Easter Basket Candy. Pick from jelly belly jelly beans, peeps, carrots filled with bubble gum, cadbury eggs, reese's peanut butter eggs. Whatever sweet treats you are looking for to place in your Easter Baskets we can help.